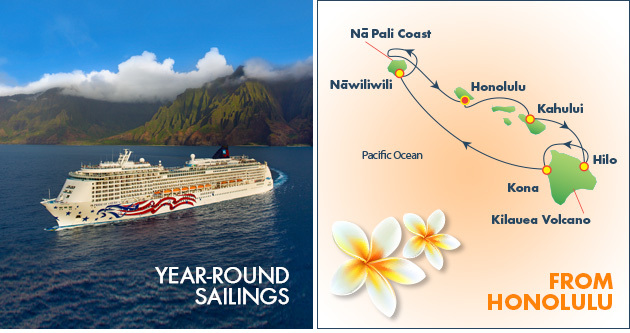 9 Day Hawaii Islands Golf Cruise NCL Pride of America - exclusive GolfAhoy offer! 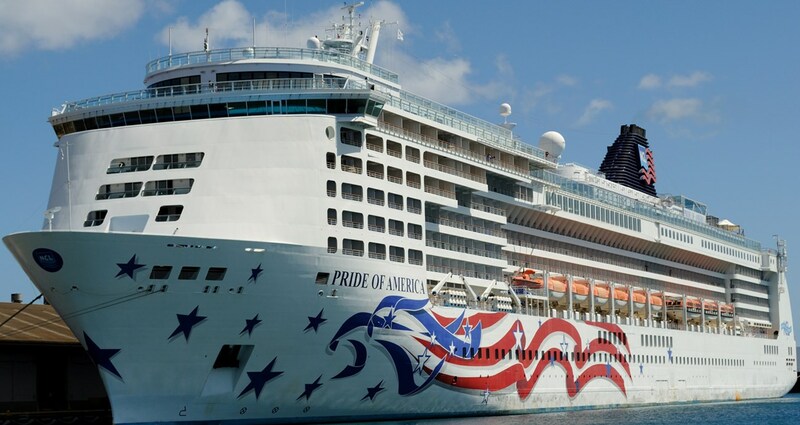 9 Day Hawaii Islands Golf Cruise NCL Pride of America – exclusive GolfAhoy offer! Hawaii Islands Golf Cruise. 9 Day Hawaii Islands Golf Cruise NCL Pride of America Balcony Cabin with 2 Night Waikiki Beach Resort pkg. Includes 5 Hawaii Championship Courses during your cruise – exclusive GolfAhoy offer! 7 Day Circle Hawaii Golf Cruise in a Balcony Cabin with 5 Hawaii Championship Course golf rounds plus GolfAhoy 2 nights pre-cruise Waikiki Beach Resort (Thursday & Friday nights) pkg. See our GolfAhoy package inclusions below. Book early. A low initial deposit guarantees the lowest fare for your sail date. Dare to compare, our bundled package pricing is unbeatable! Cruise, hotel, golf on the cruise, all included. Golfers 6th round optional add-on Friday. An 18 hole round at Ko Olina Golf Club. http://www.koolinagolf.com/ Ko Olina Golf Club, one of Golf Digest’s “Top 75 Resort Courses in the U.S.” is a challenging 18-hole Oahu golf course built in 1990 by renowned course architect Ted Robinson. Typical of his designs, Ko Olina Golf Club features exceptional water features, multi-tiered greens, large landing areas, and a moderate length which makes it perfect for beginners and experts alike. Located on the sunny West Coast of Oahu, just a short drive from Honolulu and Waikiki, Ko Olina Golf Club was home to the 2016 LOTTE Championship presented by Hershey. Twilight rate after 1:00 pm from $159 + taxes includes round-trip transportation. Includes 18-hole golf round, green fees, and cart fees. Alternative 6th round Friday option. Palmer Course Turtle Bay. http://www.turtlebayresort.com/Hawaii-Golf/Courses/Palmer-Course Consistently regarded as the best course on Oahu (and among the very best on all the islands), the Turtle Bay Palmer Course is an absolute must-play. Set along Hawaii’s North Shore, home to Pipeline, Sunset Beach, and Waimea Bay, the course meanders its way through the natural wetlands and circumvents natural waterways and dense Hawaiian jungle that offers great protection from the coastal winds and meets the ocean coast on its penultimate signature hole, the par-4 17th. Roundtrip transportation from the Hilton Hawaiian Village Waikiki Beach Resort included with your GolfAhoy reservation to Turtle Bay with a Palmer morning round of golf when purchased through your GolfAhoy agent. From $219 + taxes, transport in an air-conditioned van, 1 x 18-hole round of golf on the Palmer Course, green fees and cart fees all included. The ride takes about 1 hour and 15 minutes. Ride-along fee for non-golfer travel companion $100 subject to space availability in the shuttle van. Our popular GolfAhoy 9 Day Hawaii Islands Golf Cruise NCL Pride of America Balcony Cabin and Waikiki Beach Resort package begins all year every Thursday with your check-in at the Hilton Hawaiian Village Waikiki Beach Resort. Hilton Hawaiian Village Waikiki Beach Resort. 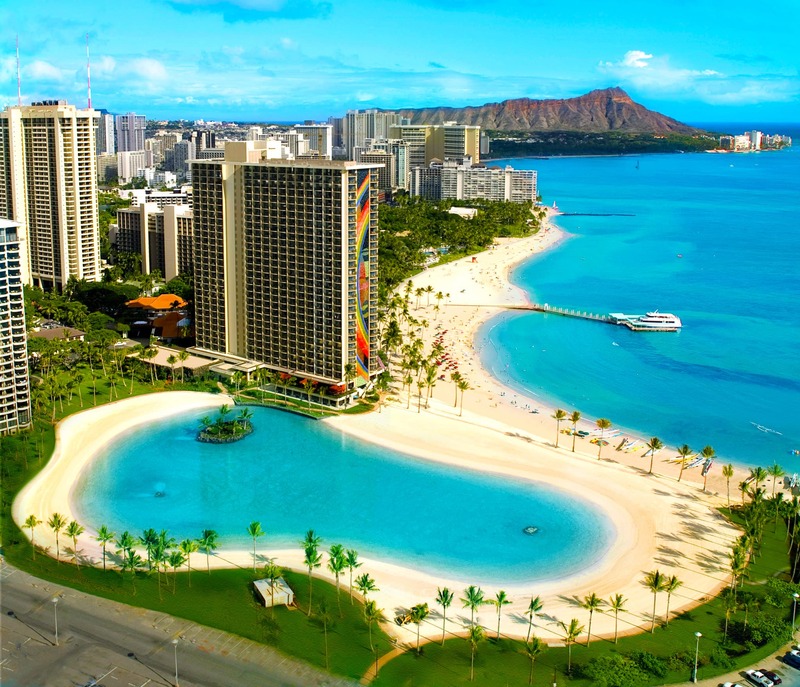 Book at least 12 months in advance with GolfAhoy if you want Hilton best view rooms and Thursday night Golden Circle Premier Seating reservations for the world-famous Hilton Waikiki Starlight Luau. Resort View Rooms (Diamond Head and Tapa Towers) Partial Ocean View Rooms (Tapa Towers). Book your air to arrive in Honolulu before mid-afternoon on Thursday if you want to attend the Thursday night *Hele Mai Ho ‘olaule ‘a! Luau at the Hilton. *Thursday at 5:30 P.M. Hele Mai Ho ‘olaule ‘a! (come to celebrate!). Waikiki’s only outdoor Luau features extravagant Lei greetings, Hula kahiko performers, 4 acrobatic fire dancers and authentic Hawaiian dining in a memorable setting beneath the starlit, mid-Pacific skies. Hele Mai Ho ‘olaule ‘a! SpeediShuttle has greeters stationed throughout the Honolulu International Airport terminals. They are also the only shuttle that can drop off and pick up guests in the Hilton Main Lobby at the resort. All other “shuttles” including the Airport Shuttle will drop you off at the Tapa Bus Terminal (about a 3-minute walk to the main lobby). SpeediShuttles and all taxi cabs can drop you off at the Main Lobby. SpeediShuttle’s Mercedes-Benz shuttles are equipped with GPS technology, which allows the staff to manage the service on a timely basis and has kept them in the highest ranking for safety in the industry. Shared Ride Starting at $15.48. Exclusive Shuttle $121. Lei Greeting $31 for two guests. Book through GolfAhoy when you have your airline flight arrival details. ʻAlohilani Resort Waikiki Beach (alternative to Hilton Hawaiian Village Waikiki Beach Resort). The all-new, vibrant ‘Alohilani Resort Waikiki Beach blends indoor and outdoor luxury to elevate the experience of Oahu resorts. The pool deck with private cabanas offers a saltwater infinity pool and a pool bar that seamlessly transitions from day to night. With a location steps from Waikiki Beach, it’s where Hawaii vacations turn moments into memories. The resort features two restaurants conceived by internationally acclaimed Iron Chef Masaharu Morimoto. The signature restaurant, Morimoto Asia features Chef Morimoto’s world-renowned dishes integrating Western and traditional Asian ingredients. Momosan Waikiki provides a more casual dining experience with yakitori, ramen, and sake along with small plates for lunch and dinner and an outdoor beer garden. Discover Hawaii with Norwegian Cruise Line, awarded Best Hawaii itinerary for 8 years running. Saturday before lunchtime depart the Hilton Hawaiian Village Waikiki Beach Resort for NCL’s Pride of America at Pier 2 in the Port of Honolulu. At the Port, next to Pier 2, you can visit the Aloha Tower Marketplace, a trendy shopping, dining and entertainment complex that sprawls over 11 waterfront acres. Last minute shopping before you board the ship. Port of Honolulu baggage handlers will transfer your golf bags and luggage. GolfAhoy recommends you tip the port baggage handlers a dollar per bag! Make sure you have attached your cabin number tag to each bag. Pride of America stewards will transfer your bags to your Balcony cabin. Don’t expect to see your luggage until after the ship sails at 7:00 pm. GolfAhoy recommends you pack a swimsuit and medications in your carry-on bag. Aloha! Welcome aboard the Pride of America, the only cruise ship that sails roundtrip from Honolulu year-round, so you can vacation on your schedule. As you journey from one exotic island to the next, learn about the Hawaiian culture through the eyes of onboard native ambassadors. Island hop Hawaii in style, with more than 15 restaurants and 12 bars and lounges on board, excellent family accommodations, spacious suites, and balconies – all perfect for whale watching, witnessing Kilauea Volcano or taking in the dramatic views of the Napali Coast. Come on a GolfAhoy Hawaii Golf Cruise of a lifetime! GolfAhoy recommends both port and starboard balcony cabins. You won’t miss a view in either! Ranked as the #1 golf course in Hawaii, playing The Plantation Course is on every golfer’s bucket list. GolfAhoy has included the best (and most expensive) Championship Hawaii golf courses for you in this package! Designed by Ben Crenshaw and Bill Coore, the course was designed on a grand scale in keeping with its location on the slopes of the West Maui Mountains and offers dramatic ocean views from virtually every hole. Its lengthy 7,411-yard par 73 layout challenges the pros, but its wide fairways and generous greens make it very playable for the average golfer. With dramatic elevation changes, this course offers plenty of downhill tee shots. You’ll feel like one of the pros when – with the aid of the aggressive slope of the 18th fairway – you will enjoy hitting one of the longest drives of your life. The Plantation Course is the site of the PGA TOUR Tournament of Champions each January featuring an elite field of previous year’s PGA TOUR winners. USA’s first most women-friendly golf course! Among the world’s great golf destinations, few shine as brightly as Wailea. Renowned for its ideal golf weather – typically sunny with gentle breezes – Wailea on the magical island of Maui is rated among the best golf courses in the USA by both Golf Magazine and Golf Digest. Here, you can experience the Wailea Golf Club, whose Championship Emerald course boasts breathtaking ocean views from every hole. The Wailea Emerald Course was designed to be fun for practically every player, the 6,825-yard Wailea Emerald Course was one reason Golf for Women Magazine first granted the Wailea Golf Club a Top Fairways Award for the country’s most women-friendly golf club, an honor that the Wailea Golf Club received seven times. Other golf authorities agreed: LINKS Magazine and Golf Digest have also lauded Wailea’s picturesque Emerald as a great course for women. Its women-friendly reputation aside, however, the Emerald Course is simply a delightful course for all players. Its carpet-like fairways, fragrant tropical foliage, and numerous ocean and island vistas capture just about everything you could expect from a golf round on gorgeous Maui. While Emerald’s friendly fairways are by no means a cakewalk, the course is ideal for players who enjoy the challenge of golf but view it as an enjoyable form of recreation rather than a grueling test of concentration and precision. Memorable holes include #6, a par 4 downhill dogleg, measuring 415 yards from the white tees. There’s plenty of landing area for your tee shot, but the green falls off sharply in all directions into grass bunkers, leaving you with a tricky pitch shot if your approach shot isn’t on the mark. Hole #11 is the longest on the course, 535 yards from the white tees, and usually into the wind, making it tougher to reach the green. One of the more unusual features of the Emerald Course is the double green shared by holes #10 and #17. The green borders a 2.7-million-gallon brackish water lake and is one of the most picturesque spots on the course. The Emerald has four to six tee boxes on every hole, enabling golfers to tailor the course to their skill level. Mauna Lani Resort features two championship courses, the Francis H. Iwi Brown North and South. Both Island of Hawaii golf courses offers a challenging experience to novice and professional golfers alike. Mauna Lani was home to the Senior Skins Golf Game for 11 years and now hosts the prestigious Hawaii State Open in December each year. Where Champions play! Here, nature and renowned designer Robert Trent Jones Jr. have conspired to create a stunning venue for golfers of all abilities. Play on the same course challenged by even the best of the best professional golfers in the PGA Grand Slam of Golf. A unique and unforgettable golf experience awaits you – one that will bring every aspect of your game into a fresh and thrilling focus. More than an award-winning Championship course, Poipu Bay Golf Course offers exceptional amenities such as an in-cart satellite navigation system that tells you the exact distance to the hole and the pin placement, complimentary bottled water and refreshing cold towels. Visit the Golf Shop at Poipu Bay for fashionable logo golf wear after your round and tell them GolfAhoy sent you. One signature Championship hole after another! Here, where the ocean meets the land, is as good as a golfer’s life gets. The Ocean Course at Hōkūala has been completely renovated in anticipation of your visit. Winding its way through mango and guava groves to dramatic seaside cliffs, MSN Travel called the Ocean Course at Hōkūala one of the world’s twelve most beautiful courses. Its little wonder that the list of accolades for this Jack Nicklaus Signature track is as long as its string of holes that hug the Pacific. This continuous stretch of oceanfront golf is the longest in all of Hawaii and a certain highlight of every visit. The GolfAhoy ‘9 Day Circle Hawaii Golf Cruise with Balcony Cabin and 5 Championship course golf rounds included’ package come with a standard unobstructed view (no lifeboat hanging outside your balcony) – Balcony Cabin. Pride of America Balcony Cabin. All balcony cabins on Pride of America are furnished with modern touches, cherry wood finishing, a flat-screen television, radio, phone, mini-refrigerator, coffee maker, a safe, hairdryer, and all have Wi-Fi access. The beds in balcony cabins can be split into two separate twin beds. You’ll get Norwegian Cruise Line’s LemonGrass products in your bathroom where you will find the lemongrass-scented lotion, soap, shampoo, conditioner, cotton balls, and cotton tips. These balcony cabins are located either forward or aft. They include two lower beds that convert into a queen-size bed, a sitting area and floor-to-ceiling glass doors that open to a private balcony with a table and two chairs. Total Approximate Size: 178 sq. ft. Balcony Size: 40 sq. ft.
GolfAhoy package Balcony Cabins are on Decks 7; 8; 9; 10; or 11. GolfAhoy package cruise fare based on Cabin Category BB. Norwegian Cruise Line Freestyle Dining. Only Norwegian Cruise Line offers the freedom and flexibility of Freestyle Dining, which means no fixed dining times or pre-assigned seating. Enjoy a four-course meal and a great bottle of wine. Or grab a burger hot off the grill. Dress up. Dress down. Sit with your friends or make new ones. Dine inside or oceanside along The Waterfront. Since Norwegian Cruise Line is the only cruise line with a fleet of ships specially built with restaurants from bow to stern, you can enjoy more dining options than days of your cruise. East Meets West Enjoy an Asian Fusion dining venue featuring freshly prepared noodles, delicious wok-fried dishes, authentic soups, and more. INCLUDED. Get your chopsticks ready for the exotic flavors of the Far East with Chinese and Pan-Asian cuisine on Pride of America, including a variety of sushi rolls and a delicious Noodle Bar. Room Service Dine in after a day at the pool. Or treat yourself to a continental breakfast in bed. Choose from an extensive menu with complimentary and a la carte items featuring everything from chef-crafted dishes to delicious snacks and treats all freshly-prepared – and delivered to your balcony cabin. Nominal Room Service delivery fee applies. Steak is the standard at Cagney’s American-style steakhouse. 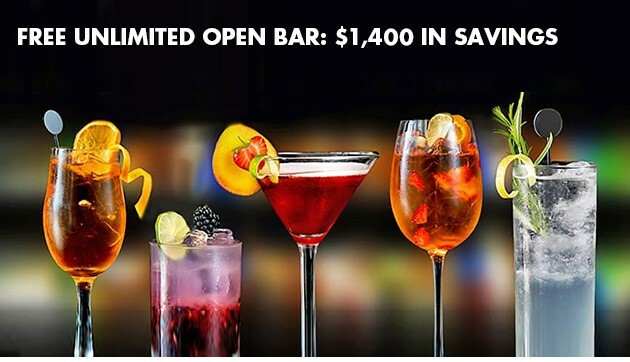 Sip your favorite cocktail as you select from choice cuts of Certified Angus Beef perfectly prepared. Price Per Person: À la carte. Tip – don’t forget to order the famous truffle fries. Have it au Poivre or just go straight for the bouillabaisse at the Pride of Americas’ signature French restaurant. Elegant interiors and attentive servers make this an intimate dining experience reminiscent of a Parisian café. Price Per Person: À la carte. Enjoy the flavors of the Tuscan countryside at tables with room for old friends and new. Dine on classic dishes where you can taste the freshness of every tomato used to make an exquisitely delicious sauce. Try a twist on a classic like shrimp fettuccine or keep it purist with an Osso Bucco. Just when you think you’re out, they’ll pull you back in with a toasty espresso and some macadamia nut ice cream. Price Per Person: À la carte. Italian Fare Specialty Dining. Enjoy the finest ingredients at this vibrant Italian restaurant on Pride of America. Dine on classics like pasta carbonara or lobster fettuccine. Then indulge in the affogato. The sizzles and surprises never cease at Teppanyaki, an authentic Japanese Hibachi restaurant. Sit at a lively shared table as a skillful chef perfectly grills steak, seafood, and chicken on a large steel grill. Optional Oahu-Pearl Harbor & USS Missouri Tour. If you have an afternoon or early evening return flight to the US mainland then consider one of our Disembarkation Day Options. Disembarkation Day Option #1 Pearl Harbor & USS Missouri Tour from US$104. Celebrate the honor, valor, and courage of the World War II US servicemen on this special tour. 7 hours, airport drop off. Disembarkation Day Option #2 Pearl Harbor Tour from US$62. Coach transfer to the scene of the devastating aerial attack by Japan that drove the U.S. into WWII. Board a launch to the Arizona Memorial above the sunken ship that is the final resting place of 1,177 crewmen. 4 hours, airport drop off. Disembarkation Day Option #3 GOLF 18 holes Ko Olina Golf Club from US$210 + transportation to course and airport drop off. Ko Olina Golf Club is one of Golf Digest’s Top 75 Resort Courses in the U.S. Gentlemen’s’ and Ladies Locker room showers and luggage storage INCLUDED. GolfAhoy limo transportation to Ko Olina and Honolulu Intl Airport INCLUDED. If you’re reading about our GolfAhoy ‘9 Day Circle Hawaii Golf Cruise with Balcony Cabin | 5 golf rounds included’ package – you might also want to consider our five star luxury GolfAhoy 10 Day VIP Deluxe Circle Hawaii Golf Cruise with Butler Service Penthouse Suite | 7 golf rounds included from US$8,794 per person double occupancy. 9 Day Circle Hawaii Golf Cruise with Balcony Cabin and 5 Championship course golf rounds included in the package from US$5,259 per person double occupancy low season.